Q: I use a Fender American Standard Jazz bass and have Labella Flats on it. It’s a great bass, but not suitable for the type of genres that I play. I am seeking for a fatter and tighter sound, as deep as possible but with a lot of clarity. I have been looking into different pickups too. What should be my current plan of action? How can I get the best of my jazz bass? I know the power lies in the fingers, but this has become an issue as I prefer less notes with deep and long sustains. And another big issue is that one of the guitarists of my bands uses a baritone guitar! A: There aren’t many sounds that you can’t get with a decent Fender instrument. They are built to cater to traditional players and traditional tones. I’ve always dug the sound (although I prefer the P-bass). My issue with Fender has always been the feel. They are very inconsistent from instrument to the next and you really have to play a bunch of them to find the one that speaks to you. That’s another column though. We’re talking sound. While I do have preferences with regard to pickups (I love the Aguilar pickups and use the P/J set in a Marleaux bass that I use in the studio when I need that “Fender sound”), I don’t believe your issue lies in the pickups. 1. If you are looking for long sustain, you should ditch the flat wound strings. This will also help with the clarity and tightness that you mentioned. When I think of flats, I think of deep thumpy notes… notes that song cool specifically because of their lack of definition and sustain. Round cores tend to lean towards a fat, traditional bass tone. Hex cores are more common and give a brighter sound and stiffer tension. Round wound is the most common and is the brightest. Half round have a smoother feel and slightly mellower tone. Flat wound reduce finger noise, are very smooth and are very warm and mellow sounding. Tape wound strings have a nylon outer wrap that gives you a short decay and more of a thump sound. I prefer the feel of nylon strings to flats, but they have a very old school, thump vibe. Steel strings are likely the most common for electric bass and are the brightest. Steels are optimal for slapping and an articulate finger style playing. Nickel strings are a bit less bright than steel strings and are also much less “grabby” on the fingers. The metal feels much slicker than steel. I prefer nickel and actually have grown so accustomed to the feel that steel strings tend to feel like they are sticking to my finger tips when I pluck the strings now. Steel core with a nickel wrap may give you the best of both worlds. Coated strings are much slicker and tend to last a little longer although they tend to get a bit frayed as they age which may or may not bother you. It may take a little experimentation but I think that you may get much closer to what you are looking for with some different strings. Perhaps some round wound, nickel strings with a round core (which may sound better to you after a week or so of playing. I always like my strings a bit on the dead side). 2. You might want to experiment with your technique. 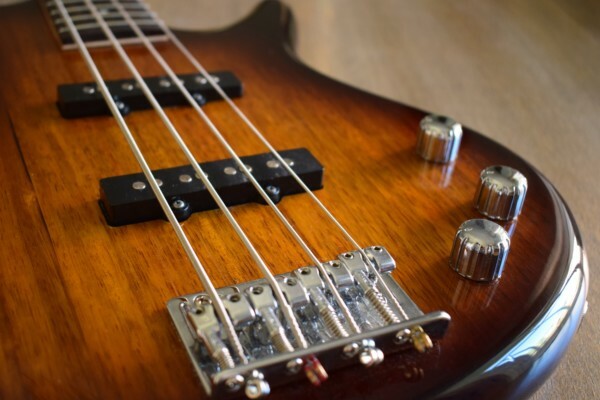 Students are often surprised at how many different sounds they can get out of their bass simply by adjusting how and where they pluck with their right hand. This is when you lay the meaty side of your hand lightly against the strings back by the bridge while you pluck (most commonly) with your thumb and index fingers (some people just use their thumb. I use my thumb, index and middle finger). This dampens the attack on the string but you can control how much muting is happening by how much of your hand is touching the strings, how hard you are pushing down against the strings and whether or not you lift your hand after plucking the note. You can actually get a thumpy, palm muted note attack with a lot of sustain if you lift your hand after plucking the note. You can also try adding a little vibrato with your left fretting finger to encourage the string to continue ringing! Plucking by the bridge vs. over the fretboard vs. anywhere in between. How hard you hit the strings and where you pluck them has a massive impact on how the note will sound. Play around with location and intensity. With enough practice, it’s possible to have a bright articulate sound as well as a nice thumps, old school muted sound without changing anything but your hand position and attack style. 3. Make sure that you really get to know your tone controls. Explore how favoring the front pickup vs the bridge pickup can change your sound. With just a pickup pan and a tone knob, you have a wealth of sounds available to you. Don’t get hung up on one setting. Fully explore your instrument. It’s also possible that you have the wrong bass for the job, but I think it’d be a waste to spend money buying a new instrument or changing your current instrument until you’ve forced yourself to really explore the sounds possible on that instrument. Many of my techniques actually came about as a result of me searching for a sound on an instrument that wasn’t meant to sound that way. I learned a lot about my sound and how to get it by exploring every aspect of my bass, pre amp EQ and technique. Readers (and especially you Fender players): What is your sound and how do you get it? What strings do you use? Did you swap out your pickups? Please share in the comments. I use Musicman StingRay with Thomastik flats and Ampeg amps and I can play anything I want and achieve sound from bright (I hate super “zing” sound and a lot of treble in bass – most of the time lost in mix so unnecessary imo) slap sound (very flexible and modern flats !) and kind of Jamerson oldschool, double bass thing too. And with Carol Kaye muting system (piece of foam under strings while I play with pick) makes my bass great for almost all tasks (many soundmen and engineers like my sound and don’t tweak it too much). If it comes to eq/effects, most of the time I set my amps flat (live I use some eq but accordingly to the band – it’s often not much bass, more specific freq on mids) and most of the time use my technique and eq on bass to achieve desired sound quickly. I have a Jazz bass that I’ve been playing for about 4 years, and have been going through a lot of different strings trying to find the right sound. I’ve tried Rotosound RWs, DR FW, Fender RW, Fender FW, etc. So far, I like the Ken Smith compression wound best, but I swapped out the original pickups for DiMarzios after the first month or so. I don’t care much for Fender products at all, but the American Standard Jazz basses are very good. Slap on a set of roundwounds and you should be ready for almost any gig. I have a deluxe active J-bass and use Daddario flats with an Orange amp. I have managed to get the tone I like by a few small adjustments. I generally run about half way between balanced and bridge on pickups. The 3 band on board eq helps for small tonal adjustments on the fly, but I normally run them flat. The rest I just messed with gain and eq on the amp. Got a really fat low end with really growling mids and highs. My favorite combination is a P bass with Delano pickups and Ernie Ball cobalt flats. Super sustain and brightness when desired. Also very fat and articulate. Sits in the mix like nothing else! Another very useful article. Thanks again! Another suggestion: try using a pick. I’m a p-bass player who played almost exclusively w/ my fingers for almost 20 years. Along with jumping from flats to rounds, I also began playing with a pick. I still prefer playing finger-style, but the pick has opened up a realm of sonic possibilities. Sometimes, it just serves some songs better. I have an all original 1974 fender p bass with dadarrio flat wounds on that I adore and couldn’t sound more chunky. It is still really brite sounding when played percussively. I have a Frankenstein 1969 Jazz bass that has all sorts of old parts on It that I have been piecing together slowly. Always used good ole dadarrio XL round wounds. I started with Lindy Fralin split single coil pups that I think are the best for quiet, virtual vintage sound. I’ve also tried Seymore Duncan Antiquities, which are nice but the Fralins are just a bit better I think. The Fralins are systematically being replaced with authentic old Fender bass pups tho. I now have a 1966 bridge pup and a 1971 neck pup in the mail. The ohm readings matched up well dispite the year difference. They just have the certain old quack and vintage sound and feel that a modern wound pup doesn’t have. Also passive pups seem to be easier to get to sound even when adjusting pickup Heighth, and also sound better thru effects to my ears. I have a Mexican jazz with Thomastiks and no changes to the pickup. Definitely not the brightest thing in an annoying ear piercing way but I love the strong fundamental it likes. I just leave everything on full and use technique to get the tone I’m going for. It’s very simple. If I want articulation I’m going by the bridge if I just wants to be big and heavy and rattle everything I play on the neck. I’ve tried about every variation in string construction and gauge. For a while I was convinced that rosewood boards needed steel round wounds to add a little more definition and nickel on maple to cut down on the clank. However, this doesn’t always work. I recently bought a Fender Elite Jazz 5 with maple fb and steels really bring out the character of that bass. I have maple P bass with round nickel and another rosewood with Flex flats. It takes some time, experimentation and expense to find the right string for the bass you’re playing. If you’re not happy with the tone changing strings is the cheapest, though not cheap, way to go. Pickups run about $100 each and are generally not returnable after installation. You may get back half in the re-sale market. New bass? Well that can run 100’s on up. Ed Friedland has written some pretty extensive articles for Bass Player magazine regarding string types and tone. It may be worth investigating but D.E. has already put you on the right track. The new D’Addario NYXL strings are awesome for the type of deepness and clarity you are looking for. I am using them on my Sire Marcus Miller V7 which is very much like a Fander Jazz. I have a few basses and I like to them all. Lately I have been favoring my MIJ Geddy Lee Jazz. I use Lindy Fralin pickups and Ernie Ball Slinky Cobalts (2732) on my bass as I favor articulation and clarity. To vary my sound I use three primary picking techniques (my fingers, a pick or I will slap) depending on the song in question, although most of the time I will use my fingers. The things is great about Jazz basses is that they musical Swiss Army knives that can be used in almost any setting. They are also quite sturdy and are easy to customize. With that being said I still love my 1974 Rick 4001; I do not favor muting and I like to be heard. Still, there is something to be said for a good Fender bass, whether a Jazz or a Precision. I won’t leave home without my BBE Sonic Stomp pedal. I dial in the best sound I can get from my amp or preamp @ any given venue, then tweak the final output “tone-age” with the Sonic Stomp. Mighty fine tool for any electric bass player. Works wonders with guitar and keyboards, also – Enjoy! – Cheers! This device will give your output signal as much warmth and roundness as you want along with as much clarity on the top end as you desire – super sweet! A lot of players just don’t get this device – but believe me – it’s a keeper for tone and presence in your signal! The players asks about “punchiness” and “sustain”. There was no mention of his signal chain or amp details, but both of the mentioned qualities are squarely in the realm of compression . By adding a compressor somewhere prior to the power amp, either before the pre-amp, with a stomp-box, for example, or after the pre-amp using the effects loop, if available. I use a Fender Jazz “Deluxe” with a P/J Pickups, play with a pick, and recently switched to flats. I occasionally play a Gibson G3 round wounds, super hot treble. Basic compressor stomp box by DOD on both, lets the attack through, while limiting the big peaks, and providing more sustain. Pedals for sustain can only take one so far, they all are based off YOUR baseline technique; bad technique=mediocre electronic assist. Good article, good luck. I have 3 Fender Precisions, all have maple necks and I usually have the volume on full and tone sitting bang in the middle: a ’79 which is totally factory spec with DR High Beams, another ’79 which is fretless with a Fralin pickup and Status halfwound strings, and a JV ’57 which has DR Fatbeams on it. When playing live I’m using a Genz Benz Streamliner 900 through a Genz Benz 2×12 cab, and for studio I run through a Line 6 Bass Pod XT Live. Strings: Def use roundwound. I love Elixirs, they may be too bright. A basic Ernie Ball set is relativity inexpenisve to experiment with as well. Pickups: For rock and pretty much anything, you cant go wrong with Seymour Duncan quarter pounders. Best inexpensive passive pups out there. Tone for days! Pick: Not sure what genre you re playing but if you wanna keep up tonally with a baritone, add some mids to your amp and try a pick. Cant hurt!